I have a suspicion that this is not an OOTB feature, without requiring some dev customization, but here goes. Is it possible to specify the query on a Content Search Web Part to filter on data that comes from a lookup column? I just can't get this to work. Here's a diagram of how I have the data setup. 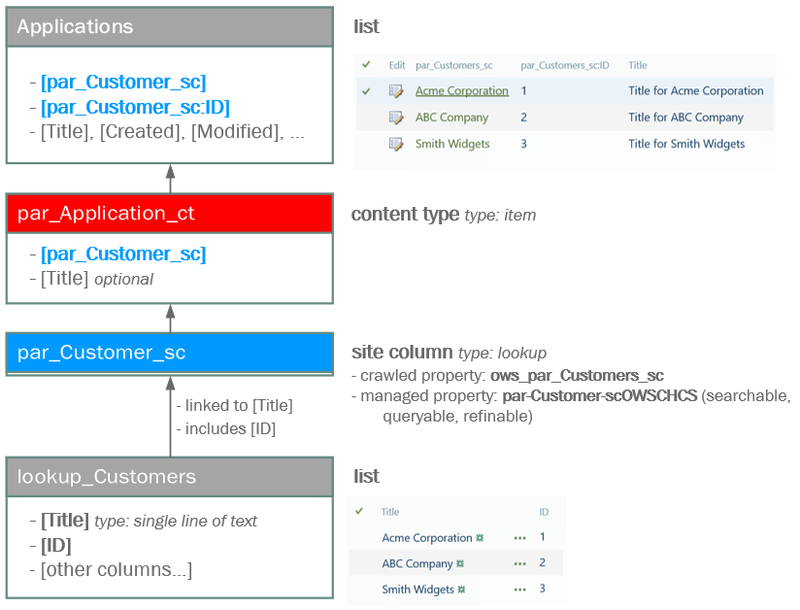 I have a list called lookup_Customers that serves as a lookup for a site column called par_Customer_sc. I chose a lookup here since the number of customers will exceed the 250 limit of a choice column. This site column is used in a content type called par_Application-ct, which inherits from a list item. Finally, I've populated a list called Applications using the three available options in the lookup table. I create the CSWP query by returning only list items in the site collection that are of content type 'par_Application_ct'. With no further refinement, I see the three records returned. If I filter using the managed property for the Customer field, called 'par-Customers-scOWSCHCS', I get no results returned. I appear to have the managed property settings defined to allow searching, etc. I've tried returning all records with a wildcard, using the exact strings, etc. but to no avail. I used the Sharepoint Search Query Tool in hopes of finding where the Customer names are getting mapped to. When I use the query string from the CSWP that gave me the 3 records, I can view all of the crawled properties...but the par-Customers-scOWSCHCS managed property is not listed. Am I missing a crucial step in the chain here? Or can anyone suggest where I can look next to troubleshoot this further? Browse other questions tagged sharepoint-server lookup-column managed-property cswp or ask your own question.